Yoshimi Futamura (Personal show 2014). The immediate response when first feeling the visceral impact of Thérèse Lebrun’s art is to ask, “How in the world does she do that. It must be something she found because it surely cannot be man-made.” Experiencing her work and thinking are virtually synonymous. Born in 1956, Lebrun is part-time lecturer in ceramics at the Ecole des Arts d’Ixelles and a fulltime explorer of the infinite possibilities of clay. Under the tutelage of Mirko Orlandini in the 1970s, she embraced the rigor of the porcelain filming technique. From 1984 to 1996 Lebrun collaborated with COBRA artist Serge Vandercam in ceramic art. In 1993, the appointment to the faculty of the Ecole des Arts d’Ixelles freed her from the obligations of commercial production and enabled her to establish her own studio. There she continued to explore the many avenues of ceramic art searching for a discipline she could call her own. In 2000 and 2003, Daniel de Montmollin mentored her. Like many other inspired and gifted ceramic artists, Lebrun’s work has undergone a more or less continuous transformation as it matured. 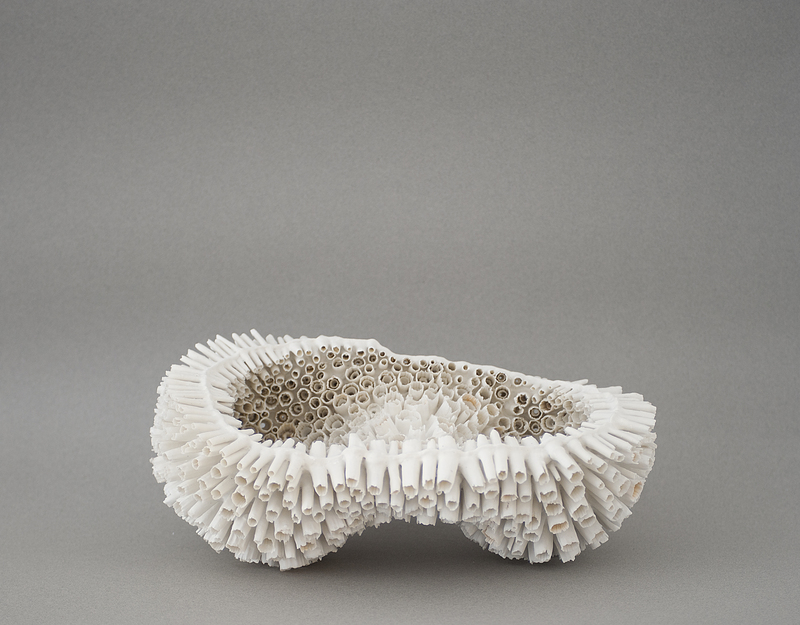 Since 2004, she has focused on mastering the potentials of paper-thin porcelain. Lebrun creates shapes, objects that are utterly empty. These are reminiscent of remnants of former living things and—dare we say it—living beings, that evolution must have forgotten to finish. Hers is the forgotten world of the past; fossils, petrified plants, and the leftover plant structures with traces of ancient rhythms, order and disorder. She continues her research using the vestiges of a past world or forms that exist only in her imagination. This is evolution that Darwin never dreamed of. 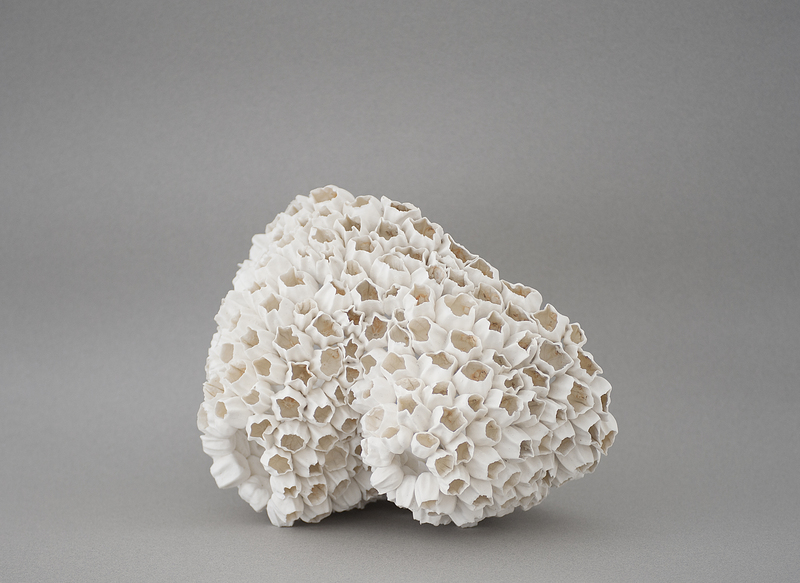 Lebrun gives us fragility, translucence, and boundaries in porcelain that touches all manner of once living surfaces. She creates hiding places for imaginary new life forms yet to evolve. Today, she works primarily in porcelain. Her pieces are not composed around a void. It is the objects she assembles that create the void we see and feel. The look is meticulous and flowing. Light passes through, from inside to outside, from outside to inside. When the light goes, only empty hollows remain, its edges whitened. During firing, the interior organic material is vaporized, lost forever. The individual elements are fused with porcelain that turns translucent when fired. The pieces are made with small repeated gestures, as one might embroider or meditate in tranquillity. 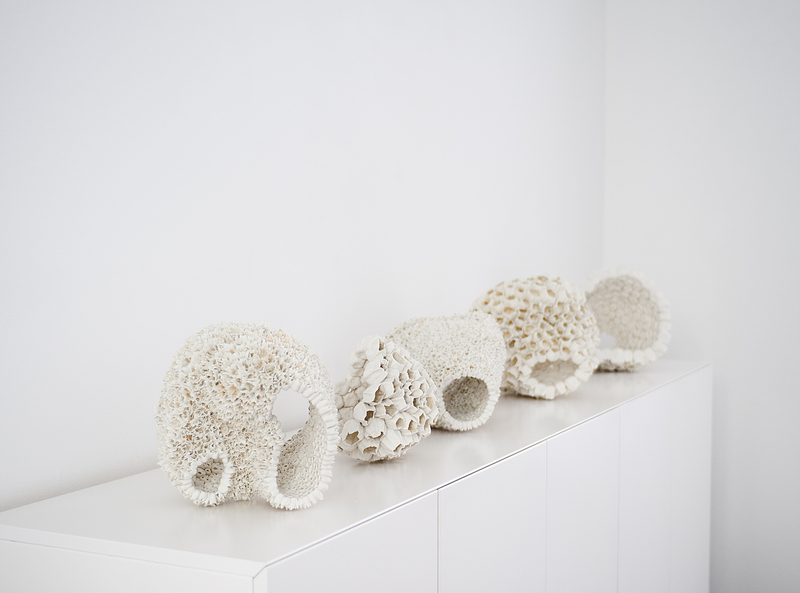 These works inevitably take us back to childhood memories of the seaside, of objects found on the beach or in the woods and cherished as only a child can.